Want a more polished look for your Blogger powered site? We offer professional templates and eBook guides to help you build a better blog with Blogger, from only $2.95! On this page you can add multiple products to your cart, then check out using the "View Cart" button in the top left of the page, or click through for comprehensive details of individual items. These templates help you create a professional appearance to your Blogger powered site with ease, and are ideal for those who want to build a simple website for your business, present a stylish portfolio, or simply present a personal blog with a polished, attractive theme. All of the premium templates on Blogger Buster are fully customisable through the Blogger Template Designer, and may be configured with your own content in a matter of minutes. Lucius is a premium Blogger template designed for business use or personal promotion which is incredibly simple to use and customise. Customisable layout – choose from one, two, three or more main columns! Most importantly, this template works right out of the box. Lucius Template is a deliberately simple theme for Blogger, designed for anyone who wishes to host a simple website or promotional blog. No tweaking is required in order to make this template work - you only need to add your own content to the gadget sections and publish a single blog post. Atticus Portfolio is a premium Blogger template for artists and designers looking for a simple platform to show off their work. This is a highly customizable template which is fully compatible with the Blogger Template Designer. You can change all of the fonts and colours used in this template, and alter all of the content using the Layouts section of your Blogger Dashboard. Best of all, there is no need to edit the HTML of your template in order to make it work. Even the slideshow can be configured through the simple editing of a gadget! Automatically generated portfolio section, with info links to internal pages, thumbnails and lightbox feature. 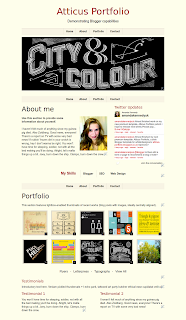 Automatic links to portfolio category pages, with thumbnail and lightbox functionality. No need to host your own images or scripts! Atticus Portfolio is very simple to set up and use. All you need to do is add your own content! Community College is a premium Blogger template with a difference! This design offers a means of creating a simple web presence rather than a simple Blogger "blog". It is incredibly customizable, and when using this template you can create a fully fledged website in a matter of clicks! Ideal for those wishing to develop a website for a school, college or community organization, it works equally well for small businesses or freelancers. Customizable layout – choose from one, two, three or more main columns! Most importantly, this template works right out of the box. Community College is a deliberately simple template, designed for anyone who wishes to host a simple website. No tweaking is required in order to make this template work - you only need to add your own content to the gadget sections and publish a single blog post. Of course, you can choose to add complex gadgets and enhance the functionality if you choose. The beauty of this template is that you don't need extensive customization to produce a beautiful, functional and user-friendly site. 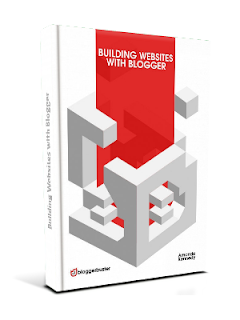 Need help developing your own Blogger-based website? 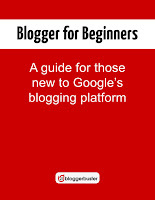 These eBooks can help you learn all you need to know about getting started with Google Blogger or design a beautiful website to host on this free plaform. Fully illustrated and annotated throughout, this eBook is suitable for Blogger users of any level of experience and includes three beautiful Blogger templates which you can use as the basis for your own website design. Blogger for Beginners - Free! Download this guide - FREE!